I've waited a bit to post a review to see how this product ages. IT'S PERFECT! The embroidery does well in the wash, you just have to fold it right out of the dryer. The Grey is more of a dark grey and I was looking for a heather grey, but I'm fine with it. It's a beautiful duvet cover! Fresh and elegant, this duvet cover set will add charm and timeless whimsy to your decor. 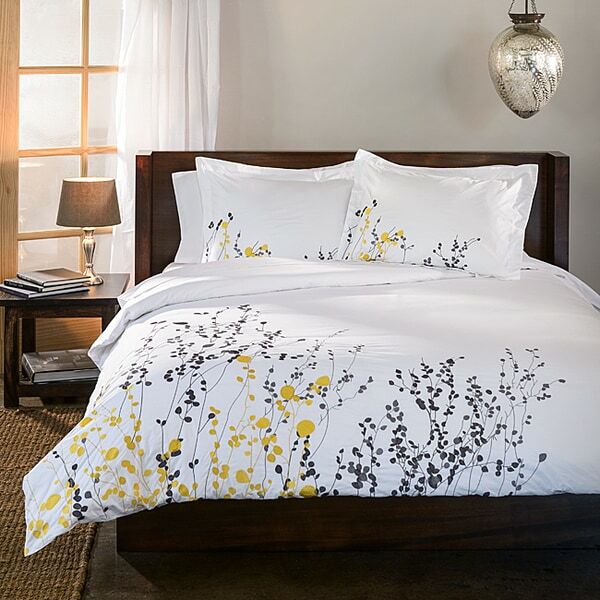 The duvet cover and matching shams are crafted from 200 thread count cotton, the white fabric embroidered with a spray of stylized grey and yellow flowers. The machine washable set features a bright and airy look, perfect for updating your lightly colored comforters or inserts. The duvet cover secures with a button closure. This is a beautiful duvet set. The material is not too thin (which I worry about with white material); you can't see patterns on the pillow or duvet through the material. It is very soft material and embroidered nicely so the design will never fade. We have cats and so far we haven't noticed any nail puncture marks in the material, which can often happen with shinier material. It looks much more expensive than it is. I only wish the embroidered pattern comprised more of the duvet cover; we have a King and it only covers the bottom left corner. I knew it would not comprise the entire cover, but a little bit more would have been perfect. After looking endlessly at BBB and other places for 100% cotton, modern looking, minimalist design duvet cover with a great price, I gave in and ordered this one, and I am glad I did. This duvet cover is beautiful, very expensive looking, a little bit on the thinner side but I dislike really heavy duvet cover so I am happy. I prefer the zipper as opposed to the buttons; my feet always get stuck in the opening between the buttons. Washed it multiple times in last six months and still looks like new. I wish I could buy more from the same brand, except that overstock doesn't mention the brand name. I put this duvet on my bed in conjunction with some flannel sheets and I love it! The cotton feels fabulous, and the embroidery is beautiful. It's not like some other embroidery's where you have some screen printed images accented with embroidery, it's all embroidered and the quality makes it really pop. I love the clean look it give to my room, and that cleaning it will be super easy since it's a lovely cotton! This duvet cover is very pretty. I love that it is embroidered and not a pattern like most covers I have seen. The pattern is minimal though in that it only covers one of the bottom corners. I wish it covered just a bit more of the cover but I was looking for something with a minimal pattern so it works well for me. Washes well. Recommend if you are looking for an almost all white duvet cover with just a subtle pattern. This is the nicest Duvet I have purchased. It is not only embroidered, but it zips closed and has the corner tabs for stabilization. Awesome! Reviews were a little misleading. Duvet is lovely! After reading some of the reviews for this Duvet I had fully expected it to have a zipper closure and corner ties for attaching the blanket inside. The duvet has neither a zipper closure, nor the typical strings inside for tying up the comforter so it doesn't shift about. I didn't actually want the zippers and am happy it came with the standard button closure. Otherwise the duvet is exactly what I expected - super soft, lightweight and embroidered, not dyed. Its very lovely in person and washes and irons easily on gentle cycle wash and high-heat iron ( for 100% cotton ). Overall I'm very happy! We have this duvet set in our guest room, which works out perfectly. One of the issues we have with this is that it doesn't have the ties inside the duvet cover to secure the duvet in place. The duvet cover and pillow cases are a bit thin, but for a guest room it has really worked out well. We have received compliments. This duvet cover is excellent quality. Reminds me of a hotel duvet cover and looks beautiful in my guest room. The 2 sham covers are an added bonus and pull it together well. I like this duvet but the picture is a little bit deceiving. The embroidery is a great quality and color but it does not cover as much area as seen in the image. This was disappointing. Its a little rough in texture for my taste but I'm a snob when it comes to sheet/bedding thread count and it seems on par for 200thread count. Also, there are no corner ties to secure the duvet into place. One wash was super wrinkled ...would need to be ironed. 2 washes the zipper is broken. This is our second year of using this duvet cover set during the summer. It has washed well and is so refreshing to behold. Nice pattern, but fabric is impossible. Very beautiful pattern, however it wrinkles badly and holds even the smallest stain! I'm not a big of fan ironing period...but the severity of the wrinkles (after wash) is going to push me to it. I was hoping for a clean, modern look, but it just looks messy and I see a lot of work to fix this in my future. Really thin, it is more of a sheet than a duvet. I waited too long to return, now uncertain what to do with it. Absolutely LOVE this duvet cover. Washes and dries to perfection. Looks so pretty on my bed. Would love to get another in a different color. This is a pretty duvet set. The stitching is nice and the colors are bright. The fabric in general is thin, but soft. It has washed very well and did not shrink. The button opening is large enough to make getting the comforter in managable. It does come out of the dryer a bit wrinkled, not enough to bother me and it does flatten out after a day or so. I feel it was worth what I paid. Love this duvet so much! Great vibe for spring! "is it wrinkle resistant? Or do I have to iron it. " Will need to be ironed. You will need to iron it. Even when removed directly from the dryer it is significantly wrinkled. I agree. It definitely wrinkles, and after having it for a short time holes started to develop. "Can I order extra shams?" We do not have the matching shams in stock. "If you want it to cover some of your box spring with a deep mattress I would get king for a queen even though it is a little wider than some! Low profile or sides on the frame a queen would be ok"
The item shows well in person. I would recommend the next larger size up, if the bed is high off he floor. "Is this duvet cover reversible and if so what does the other side look like? Lynn"
Not really is just plain white! Buttons are at the bottom so guess you could if you wanted to design! Nice soft fabric and very pretty! Was a gift for my daughter on her dark leather bed and fits nice being a little wider! "Are there tabs/ribbons to hold the duvet in place?" There are buttons across the bottom of the duvet that hold it in place. Very efficient. "Some reviews say this has zipper closure and ties others say button closure and no corner ties. Can u please clarify ??? Thank you "
Mine came with (clear) button closer and no ties for attaching the inner duvet. I added in my own ties by sewing them in. Mine has clear buttons. no ties. "what size is the full/queen?" Hello lelars, full/queen dimensions are approximately Duvet cover: 90 inches wide x 92 inches long Sham: 20 inches wide x 26 inches long. Please let us know if you have any further questions.